Have you ever wondered how a person with a permanent deformity on his/her appearance feels? How is his/her psychology affected, how is the psychosocial development of a person evolving when this deformity occurs in childhood? Can you remember how children reacted when one of their classmates had “floppy” or malformed ears? How many pupils were laughing behind his/her back or teasing him/her for the “Dumbo ears”? It is true that the floppy or protruding ears constitute the most frequent face deformity, which usually appears after birth. If such a deformity is not properly treated, it could be considered as a permanent deformity. Many studies claim that the emotional burden felt by the child with protruding ears during the early school-age period and during adolescence, can cause serious psychological problems that devastate a child causing insecurity and obsessions, which are later transferred in the adulthood. We know from Psychiatry that many of our choices during adulthood are strongly affected by positive or negative experiences which took place during the first decade of our life. It is known that childhood is the most brutal and sadistic period of person’s life, because everything is said exactly as it is. Words or expressions such as “Mr. Big-Ears” or “monkey’s ears” are easily said, so as to mock or tease someone. The earlier we intervene and correct the deformities which are negatively commented, the more we protect our child and its psychosocial development. We know today from statistical studies that the protruding ears problem is quite frequent concerning about 5% of the white race people. It is a phenomenon with genetic predisposition and is inherited as an autosomal dominant trait. Simply put, if the father or mother has protruding ears, then their child has a lot of possibilities to inherit such ears too, either both of them or just one. 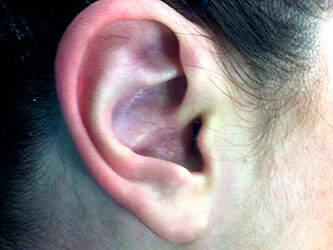 This is the most common congenital (inherited) abnormality of the auricles concerning 94% of all ear deformities. What we need to make clear, is that a child born with ear deformity is due to a genetic abnormality of the auricle skeleton growth and not due to bad sleep position. The ears are not floppy because the child “presses” his ear while sleeping, but because the cartilaginous ear skeleton has a “construction” issue due to genetics. 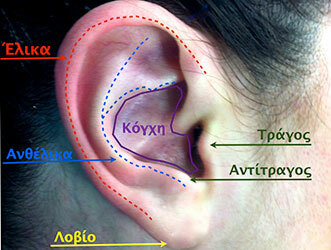 In order to understand the problem of a protruding ear we should first compare it with the anatomy of a normal ear. The auricle consists of a flexible cartilaginous skeleton presenting hollows and projections and is covered by a very thin skin. The upper part of the ear is called fossa while the lower one is called lobule. Upwardly and forwardly of the ear lobule there is a cartilaginous ridge skeleton called tragus, while the lobule upwardly and behind the lobule is called antitragus. 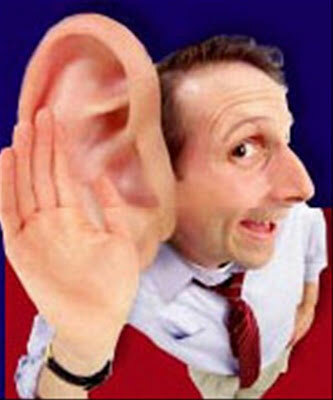 A normal ear should have a length proportioned to 1/3 of the face. The length of its longitudinal axis should be parallel to the line joining both the outer eye and the mouth corner. The helix and antihelix should be smooth, clearly formed and under normal circumstances should form a 90 ° angle. The concha of a normal ear is described as a shallow cavity surrounded by the antihelix upwardly and backwardly, downwardly from the lobule and forwardly from the tragus. 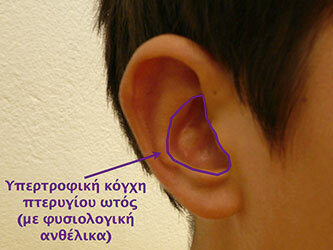 The surface of the auricle should form with its head an angle of about 25 ° – 30 °. That means that the ear should be about 1.5 to 2 cm distant from the scalp and in no case should the ear be stuck on the head. What happens in the case of prominent ears? Is there any problem in the anatomy of the auricle skeleton? Yes, indeed. The problem of prominent ears is an anatomical one. Namely, at a rate of 96%, ears are prominent because the angle between the helix and antihelix is not well-formed, resulting in the absence of antihelix. Normally this angle should be 90 °, but in the case of prominent ears, this angle is less or greater than 90 °, so the auricle becomes flattened. A second cause of prominent ears is the presence of hypertrophic concha. That means that there is a presence of a large and deep concha – a cavity that pushes forwards and backwards the helix-antihelix complex, resulting the prominence of ears. A third reason of prominent ears is the combination of hypertrophic concha with an inadequate helix – antihelix angle, often in varying degrees. A fourth and last category includes all those malformation cases or cartilage deformation mainly of the helix and antihelix, which are not related to the angle, but rather to the sharpness and smoothness of the ear contour. 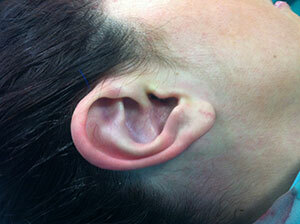 Could we prevent at an early stage or treat the problem of the prominent ears? Immediately after birth, all cartilages of the baby’s skeleton are particularly soft and supple just because the baby blood circulating hormones derive from the maternal circulation.These maternal hormones, such as estrogen, make auricle cartilages tender and pliable. Over time as the maternal hormones are rejected from child circulation, cartilages are getting harder, rigid and acquire a permanent and stable shape. Many people are not aware of the fact that the issue of prominent ears can be corrected without surgery only if a small, special, thin and elastic splint is placed at the auricle area during the first months after birth. This small, thin splint consists of a flexible soft material, which gives shape to the auricle, contributing in forming the angle between the helix and antihelix or redefining the concha. If after the first 5-6 months after birth we do not intervene to give shape to the cartilaginous ear skeleton, the ear takes the shape that is predetermined by its genetics. In that case the only solution for the correction of prominent ears is the surgical treatment of the ear malformation, called otoplasty. The otoplasty surgery should be performed during early childhood (5-6 years old) in order to avoid any psychological damage, which may provoke the facetious comments of other children. 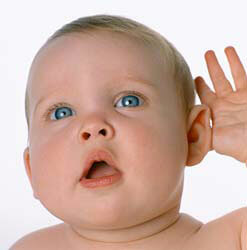 Is there any other problem in auricle development, when otoplastiy is performed during childhood? By no means. The otoplasty surgery is performed through a very fine incision on the rear surface of the ear, where we should change only the projection angles between the helix – antihelix and concha, without hurting the cartilaginous skeleton. Given that during the surgery we do not remove or hurt elements of the ear cartilaginous skeleton, the otoplasty results are completely safe and permanent without affecting the proper development of the auricle. 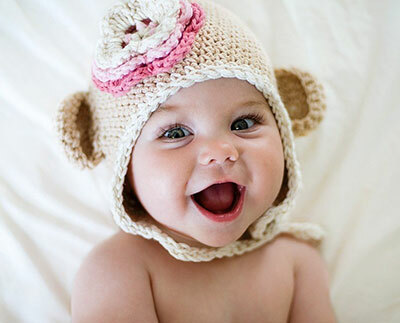 In other words, the ear of the child is normally growing at its new position after otoplasty surgery and is found in total harmony with the rest of the facial features. However, if the surgical restoration of the ear deformity is not performed during childhood, it can be scheduled later during adolescence or adult life of the individual. What type of anesthesia is applied during the otoplastics surgery? Since Aesthetic and Plastic Surgery aims at achieving the best possible results with maximum safety and less inconvenience for the patient, we should note that the most appropriate anesthesia method during the otoplastics surgery is the local anesthesia. 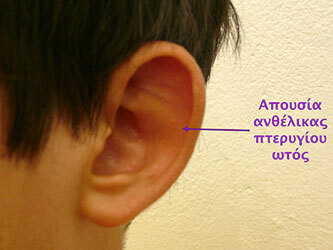 Considering that a nerve passes from the base of the ear lobule (the major auricular nerve) which innervates the largest surface of the auricle, if we locally apply a small amount of anesthetic at the base of the lobule, we can completely anesthetize the auricle for approximately two to three hours. 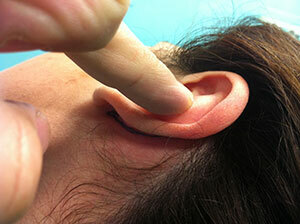 This way, an imperceptible pinch at the base of the ear makes the otoplasty surgery an almost painless procedure. In order not to hurt children, we can locally apply an anesthetic cream (EMLA formula) at the base of the ear lobule for about half an hour, which totally anaesthetizes the skin area and after that we can proceed to local anesthesia. This way the surgical procedure is painless since we do not feel any pain or even the prick of the needle of the local anesthetic. Of course, we should note that when it comes to a child during the pre-school years, then the type of anesthesia we choose is based on the fact whether our little friend and his/her parents are cooperative or not with the surgical procedure. If the patient and his/her attendants feel relatively comfortable with the procedure, then we recommend local anesthesia with the presence of the parents (usually the mother) in the surgical room. On the other hand, if patient or parents are very anxious and nervous then we choose to apply general anesthesia. How is the procedure of otoplasty surgery followed? 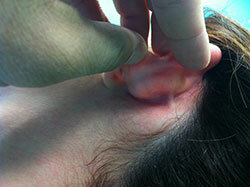 The surgery begins with the application of local anesthesia to the area directly at the base of the ear lobule. In particular we almost painlessly inject the local anesthetic to the lower limit of the lobule with a very thin needle and inject almost painlessly a local anesthetic in order to completely anesthetize the auricle. This technique applied in the otoplasty surgery, can be modified depending on the cause of the prominent ears. 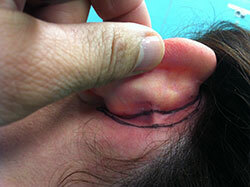 There is a combination of a hypertrophic concha with an inadequate helix-antihelix angle, often in varying degrees. There is a misshapen or deformed cartilage, particularly of helix and antihelix, which are not related to the angle, but to the sharpness and smoothness of the ear contour. Our treatment is always related to the cause. This way, we do not intervene and hurt the cartilaginous skeleton of the ears at all. We just manage to change the inclination of the ears and place them permanently this time in a new, physiological and anatomical position. The surgical incision is completely invisible, simply because the entire procedure is performed behind the ear and the incision lies completely within the post-auricular groove. Does the otoplasty surgery hurt? 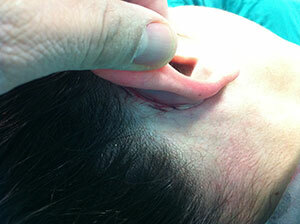 Otoplasty does not hurt at all during the operation thanks to the excellent anesthesia procedure in the area. During the early postoperative period, patients may usually feel a mild feeling of pressure or moderate discomfort –since the area presents postoperatively an oedema. These symptoms may be easily treated with simple painkillers. Generally speaking this surgery is characterized as a painless procedure. How long does the otoplasty procedure last? How will I feel right after surgery? The otoplasty surgery takes about 45-90 minutes (in more complicated cases). Immediately post-surgically the patient can leave the clinic and go home, following some instructions. 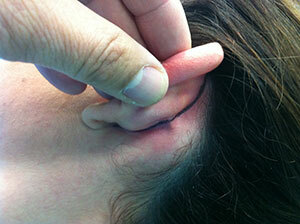 In the ear area we apply an elastic bandage, which is the next day removed and replaced by an elastic ribbon. This ribbon, which protects the ears from external factors (e.g. from other children at school), should be continuously used for seven days and after that, only during sleep for a month in total. Stitches are removed in 7 days. The patient may be allowed hung out without any problem from the first postoperative day. Ears are a little numb and swollen during the first days, but as the days go by, their feeling and image are restored at 100%. Is the otoplasty surgery dangerous? Otoplasty is a routine operation of contemporary Plastic Surgery and the results are characterized by a high degree of both patient and surgeon satisfaction. It is one of the safest procedures of Aesthetic Surgery with very low rates of complications or any other side effects. However, the most probable complications of otoplasty surgery are hematoma, local hypoesthesia, chondritis, area inflammation and moderate asymmetry. These complications are quite rare and relatively simple to deal with. Our basic principles, in order to achieve an efficient and safe result during otoplasty surgery, should be the anatomical restoration of deformity, without removing cartilage from the auricle skeleton – just the anatomical repositioning of tissue to a correct and normal position. How long do the otoplastics surgery results last? Although the cartilaginous skeleton of the ear changes over the time, the otoplasty results are permanent and do not deteriorate as time goes by. 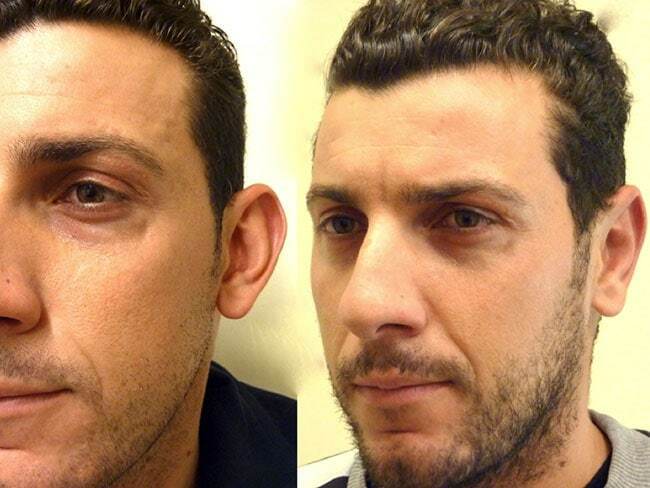 Otoplasty is a very simple surgical procedure, which is anatomically designed to restore the normal image of the facial features by changing the position and symmetry of the auricles and not by removing the cartilage skeleton components. 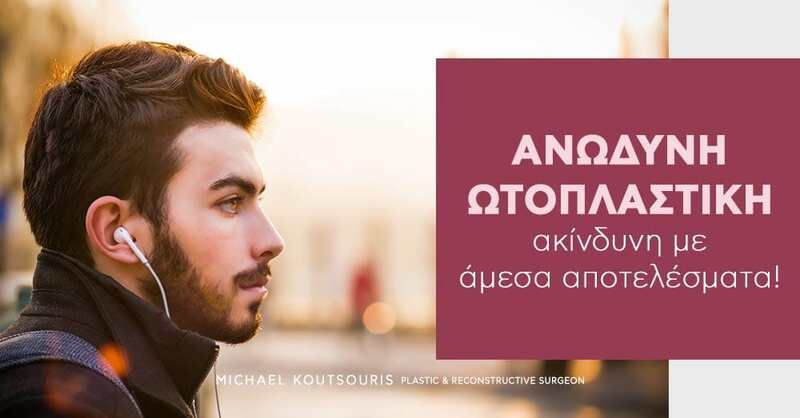 If we comply with the rules above, we conclude that “Otoplasty is performed once and for all in our life, so as to achieve a perfect result, without repeating it again in the future”. When is an otoplasty surgery considered to be successful? The otoplasty surgery is designed and performed in the whole rear surface of the auricle and it has the unique advantage that the surgical incision is totally invisible because it completely lies within the post-auricular groove. We could therefore claim that a successful otoplasty surgery is characterized by the harmonic area restoration, but is mainly based on the fact that the results look so natural that no one can tell if the ears are operated or not.